Note: The Sears barn ads depicted in this article have been scanned with high detail in order to make the ad text legible. As a result, the ad images are large and may take a few minutes to load over a slow Internet connection. Thank you for your patience. 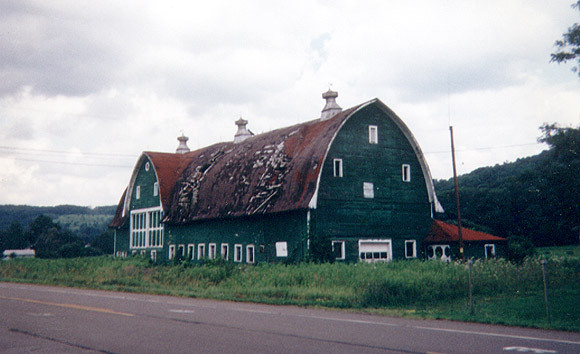 A landmark on the route between Owego and Newark Valley near Binghamton, New York is a large gothic-roof Green Barn. Reportedly the original barn on that location burned, probably due to arson, on Christmas Eve, 1928. The Green Barn, constructed the following year, appears to be a combination of two Sears barn models. Sears & Roebuck's famous catalog sold almost everything that rural America required including houses and barns. The barns, sold as kits, included all necessary materials and could be customized for size by adding increments of length and width. The Green Barn was transported by rail to the closest depot, and then by horse and wagon to site. Sears archives in Chicago provided pages from its catalogs of 1911, 1918 and 1929 that describe available barns. In 1911 the material for Barn No. 16, a gambrel-roof barn measuring 30' x 54' designed to stable twelve milk cows and six horses, was priced at $480. This included framing lumber, plank flooring, shingles, hardware, sash and enough paint for two coats. The lumber was yellow pine and the customer could choose the paint color. Sears estimated that a fair price for on-site labor and foundation concrete block would result in a total cost of $775! Please see here for the ad for Barn No. 12, another 1911 Sears offering. A kit for a round barn 60' in diameter and 48' high with cypress siding was offered in 1918 for $1,627. Sears solved the problem of large doors on a round structure by including standard ready-made doors that ran on a flat face of the otherwise round barn. The Sears ad for this barn is reprinted here. The "Prairie Chief" also offered in 1918 cost $1,591 for a 34' x 70' structure 18' to the eaves, a gable roof and designed to hold 105 tons of hay. The frame was yellow pine, the siding cypress and t & g sheathing covered the rafters. The sheathing was covered with Sears Fire-Chief Shingle Roll Roofing, guaranteed for 15 years. The Green Barn, pictured here, appears to have been built in two stages. The south end is similar to the Sears 1918 "Cyclone" barn but with modifications. It is assumed that the "Cyclone" or a similar style was still available from Sears or another source in 1928. The main entrance door is on the side instead of the gable end. The gothic-roof "Cyclone" could be ordered in widths of 24'-40' and lengths of 24'-140'; the 40' x 140' "Cyclone" with select cypress siding was priced at a whopping $3,484. The "Cyclone" was no doubt designed to have adjoining silos since the low 8' sidewalls only allowed a hay capacity of 167 tons, not nearly enough winter forage for its livestock capacity. The Green Barn, if a Sears "Cyclone", has been modified by sidewalls considerably higher than 8'. Please note the Sears ad for the 1918 "Cyclone" here. The north end of the Green Barn appears close to Sears 1929 "Springfield" barn. This section has two huge doors on the second level, which are on a track on the inside of the barn. The "Springfield" was designed for a masonry wall at the basement level and used trusses instead of purloins for roof support. By 1929 Sears only quoted prices on request. The Sears ad for the "Bloomfield" modern barn No. 3008, shown here, is representative of the 1929 offerings. The Green Barn was originally painted yellow but this changed after Roy and Sally Strait purchased the farm in 1952. A dairy operation continued in the Green Barn until the 1980s, but since then the barn hasn't been maintained. In 1996, the Tioga Farm and Craft Market Cooperative with plans to restore the Green Barn signed an option to purchase the property. However, the plan did not materialize and in 2001 the section of roof that is not covered by metal is nearly collapsed. Ed Nizalowski, Newark Valley, NY is chairman of the Herrick Barn preservation (dismantling and re-erection) project and has collected barn history for the past ten years. He can be contacted at edniz@prodigy.net. Ed. Note: Although Sears sold the best-known mail order barn, the Gordon-Van Tine Co., Davenport, IA established in 1865 claimed, "We are the largest single concern selling complete buildings." In 1941 Gordon Van Tine had saw mills in Davenport, Chehalis, WA (fir district), St. Louis, MO and Hattiesburg , MS (yellow pine and cypress district). Sales literature circa 1918 of Sears and Gordon-Van Tine illustrate almost identical models and it is likely that the Davenport, IA firm manufactured the kits sold by Sears and also sold under its own name.